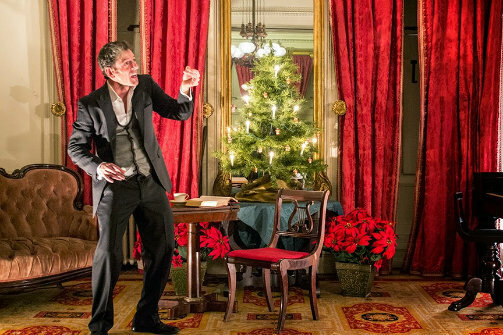 John Kevin Jones in A Christmas Carol at the Merchant's House. Photo by Joey Stocks. BOTTOM LINE: Ghosts, Scrooge, Tiny Tim, and holiday redemption are to be had at this one-man show at the historic Merchant’s House Museum. John Kevin Jones was cooking the night of the performance I attended and I mean that almost literally. The deft actor/performer who, with abundant energy, took on the voices of A Christmas Carol’s mainstays -- the narrator, Scrooge, his former partner Jacob Marley, Bob Cratchit, Tiny Tim, the Ghosts and more -- was sweating from the effort. For the rest of the audience the double parlour was quite frigid, perhaps as an homage to the Dickensian conditions of the mid-19th century. The chill certainly helped to set the mood as the tale of Scrooge the bitter miser unfolded, but our heads and hearts were soon warmed, however, by Jones who brought the many characters to life with just a change in posture or by going up or down a couple of octaves. Jones traverses the familiar moments in an abbreviated version of the novella without giving short shrift to the key plot points and themes of despair and joy, death and new beginnings. It’s Christmas Eve but that’s an ordinary work day for Scrooge and his put-upon clerk Cratchit. Scrooge’s nephew stops by to invite him to Christmas dinner, which he swiftly rejects. He does the same with two men looking to collect for charity, telling them “I can’t afford to make idle people merry.” At home later that night he sees Marley’s ghost who warms him of the dangers of turning out like him. Scrooge is unconvinced and unmoved, thinking his dinner is to blame for this spectral guest. “Marley is more gravy than grave” he says. Then he is visited by the Ghosts of Christmas Past, Present and Future before waking a changed man on Christmas Day. The production is further enhanced by being at the Merchant’s House, which was built in 1832, predating the story by a decade. It’s been preserved essentially as it was nearly 200 years ago. Adorned with period holiday decorations, it’s a special place to get reacquainted with the holiday classic. Despite A Christmas Carol being over 170 years old and the recipient of countless modern-day interpretations that almost everyone has seen in one form or another, Jones’s rendering is fresh and lively. What would make the evening perfect would be a glass of hot cider or mulled wine afterward, as I imagine people would have done in Dickens’s day.